Tri-City Psychology Services » Anxiety • Depression » Could eating pro-biotic yogurt help with anxiety and depression? Could eating pro-biotic yogurt help with anxiety and depression? The study, conducted by scientists with UCLA’s Gail and Gerald Oppenheimer Family Center for Neurobiology of Stress and the Ahmanson–Lovelace Brain Mapping Center at UCLA, appears in the June edition of the peer-reviewed journal Gastroenterology. Functional magnetic resonance imaging (fMRI) scans conducted both before and after the four-week study period looked at the women’s brains in a state of rest and in response to an emotion-recognition task in which they viewed a series of pictures of people with angry or frightened faces and matched them to other faces showing the same emotions. This task, designed to measure the engagement of affective and cognitive brain regions in response to a visual stimulus, was chosen because previous research in animals had linked changes in gut flora to changes in affective behaviors. 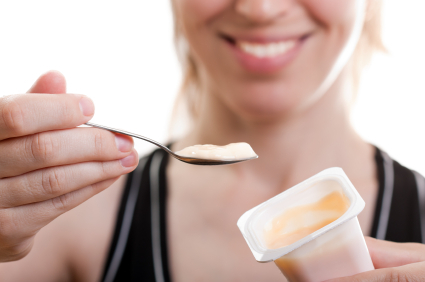 The researchers found that, compared with the women who didn’t consume the probiotic yogurt, those who did showed a decrease in activity in both the insula — which processes and integrates internal body sensations, like those form the gut — and the somatosensory cortex during the emotional reactivity task. The knowledge that signals are sent from the intestine to the brain and that they can be modulated by a dietary change is likely to lead to an expansion of research aimed at finding new strategies to prevent or treat digestive, mental and neurological disorders, said Dr. Emeran Mayer, a professor of medicine, physiology and psychiatry at the David Geffen School of Medicine at UCLA and the study’s senior author. By demonstrating the brain effects of probiotics, the study also raises the question of whether repeated courses of antibiotics can affect the brain, as some have speculated. Antibiotics are used extensively in neonatal intensive care units and in childhood respiratory tract infections, and such suppression of the normal microbiota may have longterm consequences on brain development. Finally, as the complexity of the gut flora and its effect on the brain is better understood, researchers may find ways to manipulate the intestinal contents to treat chronic pain conditions or other brain related diseases, including, potentially, Parkinson’s disease, Alzheimer’s disease and autism. Answers will be easier to come by in the near future as the declining cost of profiling a person’s microbiota renders such tests more routine, Mayer said. The study was funded by Danone Research. Mayer has served on the company’s scientific advisory board. Three of the study authors (Denis Guyonnet, Sophie Legrain-Raspaud and Beatrice Trotin) are employed by Danone Research and were involved in the planning and execution of the study (providing the products) but had no role in the analysis or interpretation of the results.